As promised, here is another story about Venezuelans in Colombia. Last week, I was out for lunch with a couple of friends and I heard the young woman taking my money say “Chamo,” to the young man who was serving me. Chamo is the Colombian nickname for Venezuelan. We ended up having a wee chat. He has been in Colombia for a couple of years and is doing well. He now has stable employment (at the beginning he just had to take whatever came to hand), he has his papers in order and is paying his health insurance and into a pension. Today and tomorrow I’m going to tell you two stories about Venezuelans in Colombia. The first I heard in a sermon preached by a friend of mine who lives in Cucutá, near the border with Venezuela. He and his wife had welcomed a Venezuelan couple into their home. One day, they offered to buy the Venezuelan couple a gift, anything they liked. The husband chose a serving of McDonalds fries. The wife asked for a bottle of shampoo. Comments Off on What would you ask for? Setting: A café in a mall. Me, having coffee. Opposite me, two men, one middle-aged, one young, are having a business meeting. Behind the young man, and technically at my table, there is a backpack sitting on a chair. The two men do not check the backpack periodically. I therefore deduce that they are not Colombian. Then they get up to go and leave the backpack behind. “Ah yes,” says the young man, with no apparent alarm, and returns to pick it up. “It’s a packback bomb,” he says, laughing, and off he goes. On Monday I was on the bus from my office to the metro when a vendor got on and started his patter, selling sweets. I knew immediately he wasn’t local from his accent and wasn’t surprised when he said he was Venezuelan. I have had Venezuelan taxi drivers here in Medellín, seen Venezuelans selling arepas and a Venezeluan has done my nails, but this was the first time I had seen a Venezuelan selling on the buses. His story was one we have heard over and over again from Venezuelans in Colombia: driven to desperation by shortages of essential items, they have come to Colombia to make some money to send back to family members left behind; in the case of my sweetie-vendor, his baby son. With no end in sight to the turmoil in Venezuela, my guess is that this man will not be the last Venezuelan I encounter selling on the buses in Medellín. Today and tomorrow I am going to tell you stories about Colombians’ amazing capacity to take on a task and in no time and with very few resources, produce something beautiful and worthwhile. Today’s story is about something that happened on our mission retreat at the beginning of October. September is the month of love and friendship in Colombia, a bit like Valentine’s Day for the whole month but including friendship as well as romance. Work colleagues, church youth groups and families play “Secret Friend”, a bit like “Secret Santa” in which you buy a present for someone in the group and when you open your present you have to guess who it is from. Anyway, we decided to play Secret Friend at our retreat but without spending any money. I took a box of scrap paper and ribbons and sellotape and pens and everybody had to make something for someone else in about an hour. 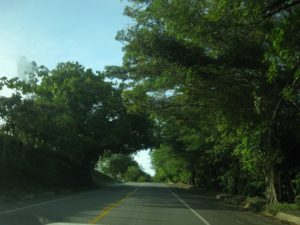 The road from Medellín to the Atlantic Coast snakes up and up the last vestiges of the Andes Mountains through countryside as green and lush as Switzerland’s until you reach the very top, in a place called Ventanas (Windows) where it is cold and misty. Then you swoop down the other side until you cross the mighty Cauca River and the road flattens out. The music on the radio changes, the Costeños on the bus cheer up and the land is now lush farmland. Every time I have crossed the River Cauca over the last nine years, the bridge has been guarded by the army. Last week, I noticed for the first time, there were no soldiers. Comments Off on Green shoot? I’ve decided that I can’t deal with the quantities of spam that have been arriving to this blog disguised as comments, some deeply offensive, so I have decided to reclaim several minutes of my day by closing the “Leave a reply” option. Thank you to all the nice, real people who have taken the time to reply over the past few years. If you really want to respond to something I have written, you can look for me on Facebook or Twitter or Instagram. Hide that tummy, put it away. Child obediently tucks her (tiny) tummy in. Which is why all Paisa woman have amazing posture.